Hippo Chow Down Game Rental | BounceGeeks.com Richmond, VA.
Time to feed the Hippos! Everyone remembers the classic hungry hippo game. Now it's your turn to be the hippo and grab as many balls as you can! Four players compete to collect the balls from the center ring, but the attached bungee cord makes it not so easy! Little kids, big kids, and adults can have fun playing and watching this awesome game. 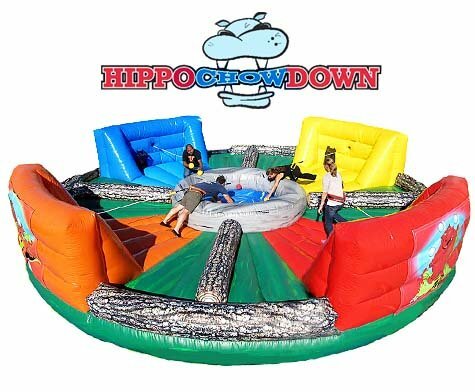 All kinds of events can use an exciting, unique game like the Hippo Chow Down, including company picnics, church activities, family reunions and more.